Posted October 8, 2018 by finnfemme & filed under Beauty, Fashion, Vintage. Another great Yardley of London Pot o’ Gloss ad from 1972! This one is for The Apple Polishers – The rich apple colors from an autumn orchard. The lovely model looks familiar, but I can’t remember her name. Let me know if you do! The Apple Polishers for lips came in shades of Delicious, Pomegranate , Winesap, Rome Beauty and McIntosh Red. The Apple Polishers for cheeks came in shades of Delicious, McIntosh Red and Pomegranate. That was supermodel Evelyn Kuhn. She was everywhere in the ’70s. 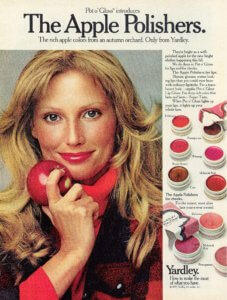 I loved Yardley Pot o’ Gloss too, and these apple ones really did smell like apples! My sister had the Macintosh one. Susan – Yes! 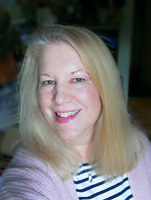 Evelyn Kuhn, thank you! That is so cool that the apple ones smelled like apples. Although I was really partial to the original Pot o’ Gloss scent. You’re very welcome! You have a cool (dare I say groovy?) web site. I miss Pot o’ Gloss products and similar items. Max Factor had mousse-y lip glosses and eyeshadows too. Do you remember the “Soft Eyes” eyeshadow from Love Cosmetics? They were a stackable trio of cream eyeshadows, such a nice texture. Also miss the “Natural Wonder” line from Revlon; it was good-quality yet affordable for this teenager!